1. Horticultural cornmeal: This is a term I coined back in the days when Alliance Milling approached me on using their corn waste product for horticultural issues. The outside edges (bran and germ) of the corn kernels were stripped away while making the starchy endosperm products sold in grocery stores. The product worked great but they sold the company and today this form of horticultural cornmeal is no longer easily available. 2. 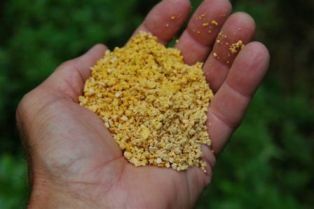 Whole ground cornmeal: This is the most commonly used product for soil amending and disease control. This product is made from the entire corn kernel. Best place to buy it is from garden centers, feed store and farm stores that sell organic products. It can be gotten from grocery stores also but for much more money. It is often sold as horticultural cornmeal. 3. Horticultural Cornmeal with Garlic: This is a commercial product from the Good Natured company. It contains whole ground cornmeal and 1% garlic. It has a disease control label and is exceptionally effective against various plant fungal diseases. It can be applied to the soil surface or mixed into bed preparation. 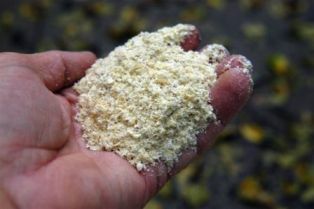 4: Corn gluten meal: This is the protein fraction of the corn kernel and an organic “weed and feed” fertilizer. It is a powerful organic fertilizer and has pre-emergent weed control capabilities. The timing for applying corn gluten meal for pre-emergent weed control is just before the weeds start to germinate. We usually guess that to be February 15 to March 15 in the spring and sometime around September 15th for the fall application. CGM has about 60% protein that equals about 9.8% nitrogen. The analysis on the bag will usually be 9-1-1 but it’s actually higher than that. 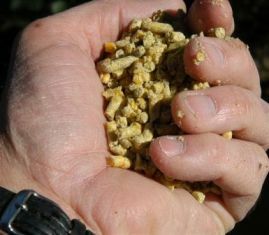 5: Corn gluten feed: A low quality waste product that isn’t recommended. This is basically trash residue that is swept up and otherwise gathered from the manufacturing of higher quality corn products. The protein level is around 18% so it has little fertilizer value and little weed prevention value. Might be good for the compost pile if you don’t have to pay much. 6. Regular cornmeal: This is the common food product sold in grocery stores. It is basically the starchy endosperm of the kernel and has low value as a food or horticultural product. Stone ground or whole ground organic cornmeal sold in grocery stores use the entire corn kernel and will work horticuturally but they are expensive. Masa, which is made by adding lime to cornmeal, has been reported to also be effective at fungus control. 7. Pelletized cornmeal: Hard to find but excellent to use as a control for pond algae. It works well because it sinks and works better at the bottom of the ponds to control algae. It is also easier to spread. About the only way to get it at present is large-quantity special orders.